Wind moving land to water. Timeless time. My backpack after ten minutes of wind. View The Invisible Paths map by clicking here. Also today, June 20, is the Solstice — meaning it's the longest day of the year in the Northern Hemisphere. This year there will also be a full moon. The two haven't conincided for 70 years. It's a powerful time to reflect, set intention and make offerings. I encourage you to do so on your own time today. I witnessed the sunrise this morning at Dune Du Sud, and did some solitary preparations for tomorrow, plus an offering to the water. These moments cast a light. They reveal shadows. They reveal edges. They reveal the flaws in our foundations. They reveal what heartbreak can make. This light can be used to rebuild by. This light can be used to wake and shake and not forsake the work we have yet to do. This light can be used to illuminate any matter of aspects that this moment has woken us up to. Both the inner experience and the outer quest. Both the deeply personal meaning of the moment and also the collective one. Ask the big questions. Feel the big feelings. Listen for the quieter responses. Tend to the tiny tugs at your heart. There is so much we can offer this moment. Mainly our humanity. Our willingness to know how our little lives intersect with our bigger roles. To know how our personal identities play out in the larger world. To connect to each other, in solidarity, so that we feel the power of collective resistance and resilience. To open to the global impact, while keeping an eye on our home front. You can read the full description by clicking here. Happy Solstice! Southwest beach. Here, I move in silence. The invisible places rest in me. They reveal themselves, slowly. Collaborating with the unknown. Allowing the hidden to speak. Embodying deep knowledge. Imprints. Storytelling. Singing sand. Moving mass of terns diving for moving mass of fish. Re-membering our origins. Bringing together that which has been scattered. Feathers. Sunset. West. Illumination. Driftwood, vertically set. June bugs buzzing and crunching along swaying dune grass. A fox here, not here. Tracks. Allowing life to weave story in me. — being air, being fire? Responsive Writing Exercise: I re-wrote "land water air fire" over and over, each time allowing my sensory experience of the wind at Dune du Sud to more deeply inform the shape and contour of the words. I've been reflecting on language. As an English speaker, I'm a minority on the archipelago. With the exception of two English speaking communities, the dominant language is French. Even though I grew up in southern New Brunswick - which means I took French classes until I was in grade 9 - I'm decades out-of-practice. And, even in grade 9, my fluency was far from mastery. Since being here, there have been situations where I have been communicating with someone who speaks no English. Maybe a few words. In these moments, I've found myself simultaneously trying to recognize French words, but also paying attention to the shape of the words, their texture and tone, and how they're carried in the body of the speaker. Through the latter awareness, I feel I'm sometimes grasping a deeper level of meaning in the language. Something resonate with the landscape. Back in the Winter, I suffered a concussion. I hit the left side of my head very hard on a wooden beam. What followed was three months of healing. In the first month, I had shifts in sensory experience, particularly with sound and language. There were moments where I would experience words through the senses, however there was a delay interpreting them through cognition. For instance, if I heard the word water, I wouldn't be able to immediately attach the word to language, and the meaning of water. It was as if I was having the opportunity to hear language through origin-al place, rather than a superficial understanding. In all of this, I felt drawn to birds. I would listen to them for hours. Knowing they too spoke a language. A language that was comforting to me. "Only by altering the common organization of his senses will be able to enter into a rapport with the multiple nonhuman sensibilities that animate the local landscape." I wonder what it would be like to embody the rhythms and the contours of the wind, in language? To write words that become sounds, and sounds that become contours, reflective of landscape, movement. Can we dis-member and re-member language so that it becomes embedded in real landscape, rather than being a landscape in itself that is floating above and away from the natural world? Whenever we of literate culture seek to engage and understand the discourse of oral cultures, we must strive to free ourselves from our habitual impulse to visualize any language as a static structure that could be diagrammed, or a set of rules that could be ordered and listed. Without a formal writing system, the language of an oral culture cannot be objectified as a separable entity by those who speak it, and this lack of objectification influences not only the way in which oral cultures experience the field of discursive meanings, but also the very character and structure of that field. In the absence of any written analogue to speech, the sensible, natural environment remains the primary visual counterpart of spoken utterance, the visible accompaniment of all spoken meaning. The land, in other words, is the sensible site or matrix wherein meaning occurs and proliferates. In the absence of writing, we find ourselves situated in the field of discourse as we are embedded in the natural landscape; indeed, the two matrices are not separable. We can no more stabilize the language and render its meanings determinate than we can freeze all motion and metamorphosis within the land. Responsive Writing Exercise: I re-wrote the phrase "sound of wind" over and over, each time allowing my sensory experience of the wind at Belle Anse, the beautiful cove of caves, to more deeply inform the shape and contour of the words. These are the last two lines of the exercise. — Emilie Conrad, "Life on Land"
Îles-de-la-Madeleine author Nathaël Molaison wrote a beautiful piece about my project for Le Chant des Pistes | Songlines Residency. You can read it by clicking here. Also, storyteller and medicine woman Manon Lacelle illustrates her response to my work through story on CFIM 92.7 FM. Listen below. Sound, by its very nature, requires a physical medium to travel through. This is why you can't hear anything in outer space. Here on Earth, we're surrounded by sound. Silence is relative. At every moment, sound is created and impacted by the physical world, and the physical world is created and impacted by sound. One of my earliest memories is sitting beneath tall birch trees with my grandmother, the wind blowing gently through their leaves. I still remember the sound. To describe the texture of that sound, I would describe the leaves. Their shape, size, colour, how many, how dense... Then I'd have to describe the trees themselves, the earth they are rooted in, the curve of the hill they are on, the field down the road that seemed to pull the wind toward it... Then I'd have to describe the season, where the sun was in the sky, and how it was pouring through the branches, casting shadows onto our faces as we listened... All these physical elements, and how they relate to each other, inform the texture of the wind. The wind, the essence, the spirit. The trees, the physical world, vessels. We need both for sound. Neither comes first. They are voices of each other. Eternal collaborators of reality. And their place of interaction is texture, a point of creation. A Madelinot took me on transformative journey along the red sandstone cliffs of Belle Anse. Not too far West from where I'm laying my head in Fatima, Belle Anse feels like a dramatic departure. It's West-facing, cave-filled cliffs conjure up feelings of mystery, initiation and metamorphosis. The "beautiful cove" is a significant place for my guide, particularly one cave. Over twenty years ago, the cave was a personal source of creative inspiration and transformation for them, strongly connected to the wind. They hadn't returned in many years so, on this day, we were searching for the cave whose exact location had been forgotten and whose form had likely changed due to erosion (both to landscape and memory). When we arrived, we followed a path along the cliff-side littered with mounds of sea parsley, exchanging words along the way. They spoke mostly French. I, English. However there was a lot that was understood. The wind was really whipping up the landscape on this day, and with every turn I was struck by how much Belle Anse lived up to its name. We reached a point on the cliff-side where it seemed we could no longer walk along it, so we proceeded inland to find another way. We walked back a half a kilometer, past an abandoned, wind-beaten shack, until we found the beginning of a path through the woods. The path didn't last long however, and once in the woods, we were scrambling over and under thick brush. We moved down into a bog with water flowing back toward the cliffs, so we followed it. After much time, we finally reached the edge of the woods and found ourselves in a watery open area, fifty feet away from the cliff's edge. I looked to my left and noticed an open and short path that we could have taken. But the journey through the woods felt necessary. We walked further along the cliffs, and I spotted fish eggs that were gathered in the shape of a circle inside a cove. We stopped and watched it for some time, as two black guillemots floated nearby. The foam was continuously hinting at changing form, revealing some possibility, but it always maintained its circular shape. We then began to walk to the other side of the cove, as we couldn't see the back of it from where we were standing. We had to make our way inland again to round a long and narrow cliff inlet. I stopped at the back of the inlet to listen, as my guide moved further ahead. The sea waves we're picking up density and momentum as they moved through the narrow passage, and slammed against the back of the inlet, making a low, thud sound that vibrated through the earth I stood on. After staying with the full-body sound experience for awhile, I noticed my guide was now on the other side of the cove standing still, looking to the back of it. So I made my way to them to see tear-filled eyes. I looked to where they were looking, and saw the most beautiful cave I have ever seen. And, in front of it, was the white circle of foam that we had intently watched from the other side, mirroring the shape of the cave's mouth. I was so moved by what I was witnessing. It felt sacred. The sense of sacredness wasn't so much to do with the beauty of the form, but something felt and unseen. It was the energy, the process, the story in the land, the moment. It was the journey we had taken. It was my guide reconnecting with a significant place. I didn't take a photo of the cave. Nor did I record any sound. I just focussed on fully witnessing the moment, through all the senses. I knew that this was a place one should only fully experience by being present, which included making the journey there. What makes a place sacred? What is our responsibility when we witness something sacred? Feel free to comment below. I invite you to watch an interview with Max "Duramunmun" Harrison, an elder of the Yuin Nation of Southeast Australia. In the beginning of the video, he talks about sacredness in the land, saying: "You can't see sacredness, you can't see spirituality, but you can feel it, you can live it." To listen. Listen to receive. Receive to listen. To pass like wind through the landscape. As I headed North to Grande Entrée, I felt a call to go on a solo hike through the woods, dunes and beach of L'Echouerie Beach at the East Point. In the last century, the beach was an important refuge to a colony of walruses. However, on this day, I didn't see sign of any living beings other than birds for miles along the shore. The wind was almost non-existent, the sun was out and I felt in a dream-space. After having spent the prior few days recording, I decided to not take any gear with me. I wanted to listen, but not just with my ears. I wanted to listen with my whole body. As I walked, I imagined there were ears on the soles of my feet, and with every step, I let the ground/sound receive me. I was so quiet and resonant with the environment, that the songbirds were coming close. Is it possible to inhabit silence? The way in is the wind. As I met the waters edge, I saw a gull feather resting on the beach. I kneeled down to look closer, and it began dancing. A kind of ecstatic compass dance, turning over on either side and changing directions repeatedly. I then walked again, and began to hear the sand singing beneath my feet. Naturally, I began walking in a small circle, and allowed it to get larger and larger — a continuous echo of the original gesture. After the echo-circle walk, I found my way inside a small dune, and took a nap. Upon awakening, I was covered in sand, including the entire right side of my face. That night I dreamed of the creation time of the Islands. The time prior to human inhabitants. I looked closely at the geology, and saw the beaches as wings underwater. As I made my way North along the archipelago, passing Île aux Loups, I found myself in a transitional environment — a very long stretch of sand dunes, water on either side. The sense of liminality was dramatic. Having just arrived to Îles-de-la-Madeleine days prior, being in a wind-swept place of transition was a reflection of where I was internally. I noticed a beach on the West side of the dunes, and as I considered stopping, I spotted a fox. A symbol of silence, patience and adaptability (amoung other things), the fox-with-hair-the-colour-of-dunes came quite close, sat down and looked at me. Then it began to look around. As we shared space, I felt myself arrive. Then the fox departed, heading South along the dunes. And I found an opening to the beach. Upon arriving to the beach, I felt like a scavenger. Driftwood littered the white sand, as calm wind and waves met the shore. I began collecting some large pieces of driftwood, not sure why. Then a tern flew by and I found myself standing on a piece of fishing line. The next step became clear: I partially buried two pieces of driftwood in the sand, and tied the fishing line some 30 feet between them. I then attached a contact mic to the line to record the sound of wind moving it. 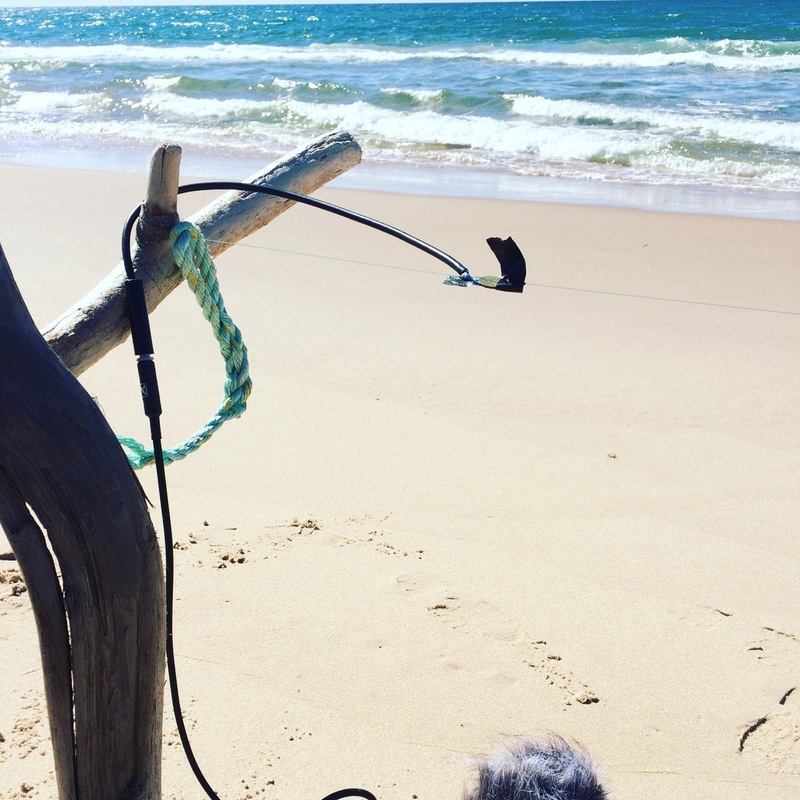 I left the mic partially exposed to the wind, so you hear not only the fishing line, but the wind making contact with the mic as well, and some of the waves in the distance. I laid on the beach for an hour, listening to hidden sounds and what becomes possible when wind interacts with material. Near the end of my recording time, I looked out to the water to see gulls and terns amassing, diving down repeatedly in the water, hunting fish I couldn't see. I need to thank UK-based artist Helmut Lemke for exposing me to the idea of using fishing line to record the sound of wind. Last year we collaborated on a piece in the Bay of Fundy called Air/String Sun/Water. I highly recommend you check out his listening-based sound work. 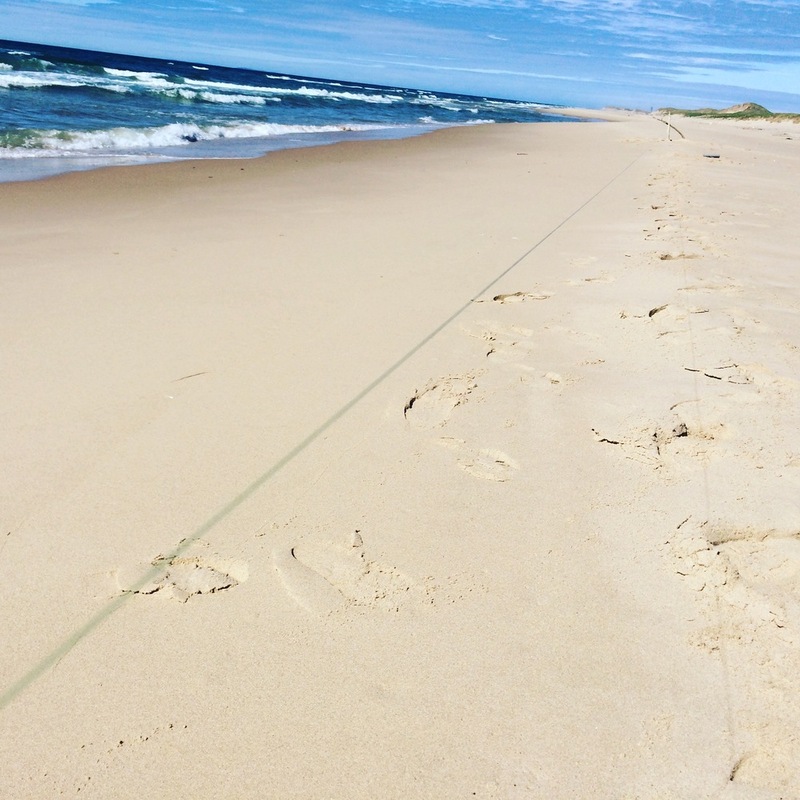 Following my recording of the fishing line, I walked a bit South along the beach, feeling in a silent space. I came across a purple-ish sand, deposited in different patterns along the shore (see image above). I've been told this sand is magnetic (or "magic"), so stay tuned for some future experimentation with it. After investigating the sand, far ahead I saw two forms on a small sandbar that looked like seals. Or bodies of some kind. As I got closer, I found two bodies of wood, quite different from each other, but very related. They had a weighted silence which has carried on into the days following. My first point of arrival is the Darrieus Wind Turbine in Île du Havre aux Maisons. A human-made structure intended to harness wind energy to create electricity, it's been inoperable for years due to structural instability. So it sits still, like a silent beacon on the landscape. The landscape surrounding it is an endless sea of dunes and mounds that are filled with shrubby and coarse vegetation due to glaciation and wind. Approaching the Éolienne (wind turbine), I wondered how the wind was impacting it, even though it wasn't moving. So I stuck a contact mic to the steel and listened. The structure is silently singing, murmuring. Below is a recording. Prior to arriving on the Magdalen Islands, my intention for The Invisible Paths project was to pick a single area to listen to and develop place-responsive work in. However, once I arrived and began exploring, I realized that there are multiple places I feel deep resonance with, and I continue to discover more as I make my way through the Islands. The land here embodies temporality and movement. Air, water and deep geological forces are continually re-shaping the landscape. Clearly, nothing is permanent. For the duration of the Songlines residency, I will be witnessing the environment, allowing listening to inform my path. As I make my way, my body and drum will be receptive to the unseen and invisible voices of the landscape — creating multiple resonance points through the archipelago. For a few years, I've been doing a lot of work with water on the Bay of Fundy, Nova Scotia. Two years ago I walked in the tide. At the end of my six-hour, slow journey, I took the white fabric I had been wearing off, and let it float away into the ocean. Almost a year later, I returned to the same beach, where I was digging up some red mud to dye paper. As I dug, I came across a piece of fabric. I pulled at it, and as I uncovered the mud-soaked material, I realized it was the piece of fabric I had let go a year earlier. However, I still couldn't believe it. It wasn't until I took it to the water, washed the mud off, and the wind gave it form that I finally believed it was my fabric. It has spent a year in the ocean, and now the water gave it back to me (see images above). Prior to arriving on the Magdalen Islands, I had dreams about the wind. I saw images of sand continually creating new forms, and birds soaring around wind-swept coastlines. As I spend time here, I've experienced how pervasive the wind is. It seems to permeate all aspects of life and form, speaking it's own language, and making things speak through interaction. It has such a strong influence that it's a kind of wild place onto itself. As I pay attention to the wind, I realize that this is the spirit I wish to understand and embody here as I make my way — the spirit of the wind. The wind is freedom, yet it finds character and shape through interacting with the physical world. The source is seemingly unknown, yet it is speaking and making things speak. It can disperse all, shatter, but also can re-memeber. Shaking things to their core, rattling possibilities into existence, only truth remains, resonates. The wind is constantly interacting, moving, re-shaping. For five years now I have been investigating traditional drums and drumming through mentorship, cultural exchange, self-driven research and practice. Incited by a desire to explore the spiritual dimensions of drumming as well as engage in a cultural practice that facilitates a deep connection to my Aboriginal ancestry, my research has been concerned with how the drum reflects the environment it comes from and how drumming can facilitate connection to place. In the Spring of 2013, I built a traditional deer-hide frame drum with Mi'kmaq Elder Carla Silver on the South Shore of Nova Scotia. After stretching the hide over the cedar hoop, the completed drum needed to settle for three days before it could be played. Initially, I couldn't wait to play the drum, curious about how it sounded. But half-way into day one, I realized that the first hit of the drum was a point of no return — as soon as my mallet struck the deer hide, my imprint would be received and I would know the drum's sound. So I settled into the days of silence with the drum. In this sacred space, I had the realization that the drum wasn't just in the world to make a sound through receiving my gesture; I sensed that it was here to tell its own story — the story of its materials – deer-hide and cedar – and the life of the animal and tree prior to becoming a drum. I also sensed that the drum was always listening and responding to the environment, even when it wasn't being played. In this way, I saw it as a witness and living archive, continually in a process of transformation. As the days progressed, I found myself more deeply inhabiting a state of stillness that was filled with potentiality and power, mirroring the drum. And, out of our mutual silence, I finally hit the drum with such presence and receptivity, that I felt my gesture deeply received. The sound I heard wasn't just a sound, but a grounded marker of the moment. A moment that felt like a rite of passage. Since, my drum and I have created a lot together. My mentor told me that every so often, traditional drums need to rest, and that I will know when the time has come for my drum to be silent for awhile. I feel that time is now. The last two years have been a big out-breath of artistic production, and it's now time to take a big in-breath. As I return to the silent, receptive space with the drum, my mirror, I re-consider the drum as a witness, resonant body, recorder. I consider how the drum is me, and the landscape, and all that is tangible — and I consider the ability of physical phenomena to be vessels of/for spiritual phenomena. I consider how the drum is not only a kind of microphone, amplifying gesture, but also an ear, listening and responding to the environment. Composer Pauline Oliveros describes the difference between hearing and listening, saying hearing is a physiological process, whereas listening is hearing with awareness, thoughtful attention. In this way, listening is a creative act. One that I wish to cultivate, deepen, broaden. I think of this listening place as a kind of dreamtime; a necessary creative space of origins necessary to inhabit. Here I will be getting to know silence and patience. I will be listening to engage. Embracing what is present. Responsive action. Following mysterious calls. And cultivating the mostly invisible art of receiving. I will be sharing the journey here, beginning with my listening experiences during the Le Chant des pistes / Songlines Residency on the Îles-de-la-Madeleine. For the duration of Songlines, I will be witnessing the environment, allowing listening to inform my path. As I make my way, my body and drum will be receptive to the unseen and invisible voices of the landscape — creating multiple resonance points through the archipelago. I will share some of my discoveries and interactions here. To find out more about Songlines, please click here. Thank you to curator Caroline Loncol Daigneault, Laurène Janowsky and Alphiya Joncas at AdMare centre d’artistes en art actuel des Îles-de-la-Madeleine and all the supporters.